Scintilla Charter Academy's diverse student body comprises 500 students in grades K-5. After the school’s first year, students’ reading scores were disappointing. Nearly three-fourths of Scintilla’s third-, fourth-, and fifth-graders could not read at grade level. In the spring of 2016, a new administrative team recommitted to the school’s mission of educational innovation. They researched successful educational models and embraced EL Education’s approach to curriculum, instruction, and school culture infused with rigor and joy. The team negotiated a professional services partnership with EL Education to pilot EL Education’s Language Arts Curriculum in grades K–5. In the first year, Scintilla worked to implement the curriculum with virtual support from EL Education curriculum support specialist, Wendy Hodgson. According to the school’s instructional coach, Liz Freitag, “That was enough to get us started, and our enthusiasm grew with the results we saw— first intuitively, and then with hard data.” School leaders were also strategic in supporting teachers who were implementing the curriculum by phasing in new teaching practices one at a time. Teachers with fewer than three years of experience were especially enthusiastic. The curriculum provided detailed lesson plans and explicit guidance in instructional practices, and they didn’t have to “unlearn” practices that had already become habits. Freitag then facilitated grade-level team meetings in which teachers collaborated to synthesize lesson plans and identify their next steps for planning and assessing. Each teacher also had a chance to observe a peer who was teaching the curriculum and to reflect together on what worked and what didn’t. In the end, even resistant teachers were persuaded by the results. “When a teacher with 26 years of experience saw that students in the classroom next door with the novice teacher were growing more than her own students, she was ready to give the curriculum a try,” said dean of students, Mandy Avera. An important reason teachers felt successful was because character is fully integrated into how and what kids are learning. Teachers discovered that teaching conversation norms and practicing them intensely enabled students to run a respectful conversation on their own, even in first grade. Scintilla Charter Academy primary students showed impressive growth on the NWEA Measures of Academic Progress (MAP) assessment from fall 2016 to spring 2017 compared to a 2015 nationally representative norm sample. Kindergarten students achieved a gain of 21.3 RIT (Rasch Units), 4.3 RIT better than projections based on the norm sample, which put them at the 93rd percentile for growth. First- and second-grade students also beat growth projections by 2.2 and .6 RIT respectively, putting them at the 79th and 58th percentiles for growth. RIT (Rasch Unit) growth results from fall 2016 to spring 2017 for Scintilla Charter Academy and the MAP Norm Samples in grades K-2. While Valdosta City and Lowndes County (districts from which Scintilla draws) and Georgia’s overall proficiency rates remained steady from 2015-16 to 2016-17, Scintilla’s overall proficiency for third- through fifth-graders rose dramatically—by nearly 14 percentage points. Scintilla’s growth outpaced the gains made in the district and state by more than 10 percentage points. Percentage point gain in students reaching proficiency on the Georgia Milestone’s ELA assessment from spring 2016 to spring 2017. 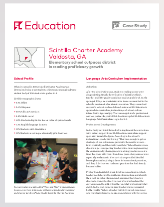 Download the PDF of the Scintilla Charter Academy case study here.